Crazy Hazy, originally uploaded by captainjay. 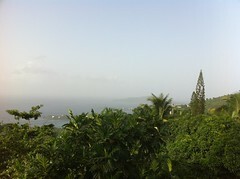 The Saharan Dust has taken over the Virgin Islands. It is so hazy out I can barely see past my deck railings. It's not very pretty but it keeps the storms away so that works for me.